SAS, founded in 1976, is privately held, one of the earliest software companies and a well-known brand in the BI and analytics market. The vendor has specialized in data management, business intelligence, data visualization, advanced analytics and industry-specific analytic applications for decades. SAS’s traditional BI offering, SAS Enterprise BI Server, covers dashboarding, OLAP and reporting through clients such as SAS Web Report Studio and SAS Enterprise Guide. SAS also offers a variety of analytic applications to address different industries and application domains. Currently, the bulk of these applications are based on the SAS 9 architecture. To target business users, SAS released SAS Visual Analytics back in 2012, which was complemented by SAS Visual Statistics in 2014. In 2016 SAS introduced SAS Viya, a new open and cloud-ready platform for analytics. SAS Viya extends SAS 9 to serve all types of SAS customers’ analytical needs. SAS Viya and SAS 9 are now collectively known as SAS Platform. SAS Visual Analytics 7.4 was the last release on SAS 9 architecture and was replaced by SAS Visual Analytics 8.1 (released in March 2017), which is completely SAS Platform (Viya)-based and uses the new CAS in-memory engine. This product line focuses on visual data exploration, dashboarding, ad hoc reporting and analysis. SAS Visual Statistics complements the product with more advanced options for predictive modeling. Add-on products like SAS Visual Statistics and SAS Visual Data Mining and Machine Learning are also available on the SAS Platform (CAS). SAS has always been a specialist analytics vendor. For many years it offered BI functionality with its well known SAS Enterprise BI Server platform. Today, the vendor offers different analytics solutions focused on various user types. SAS bundles them into SAS Platform. For instance, its SAS Visual Analytics and SAS Visual Statistics modules provide an intuitive self-service environment for business users (end users and business analysts) to perform statistical analysis and data exploration, and create reports, analyses and simple dashboards. The traditional SAS solution consists of either a web or a Windows front end and a web-based middle tier server, which communicates with the SAS servers. The core of SAS is Base SAS, an analysis and data management platform with its own programming language. At the most basic level, SAS users are programmers who create procedures for accessing, analyzing and transforming data. SAS allows SQL statements to be tied into its own syntax but also provides additional features of its own for accessing data – automatic, platform-dependent SQL generation and a macro language to automate and simplify the underlying procedures. SAS was originally designed to work with data sets stored in individual files and accessed by scripts. SAS metadata is in Base SAS syntax. SAS is used predominantly in large enterprises in mid-sized to large scenarios. The solution’s main usage scenarios are quite interesting. 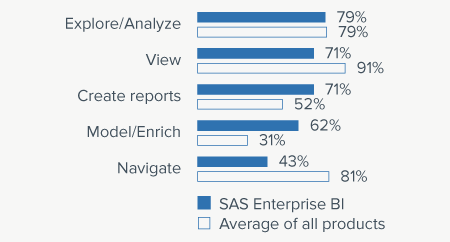 Like last year, SAS Enterprise BI products are mostly used to query data and create reports. However, customers also seem to use tools such as Enterprise Guide to prepare and model data as SAS customer rates of modeling and enriching data are twice as high as those of competitors. 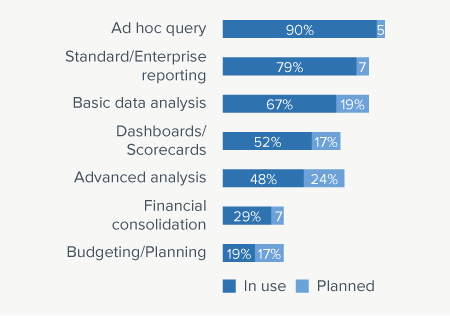 48 percent of respondents use the solution for its original purpose: advanced analytics. 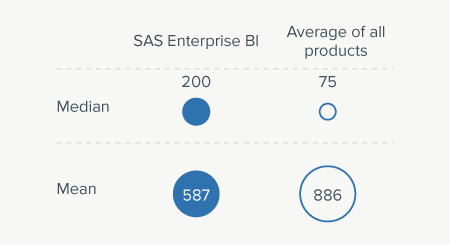 BARC’s Vendor Performance Summary contains an overview of The BI Survey results based on feedback from SAS Enterprise BI users, accompanied by expert analyst commentary.